Complete Anthem Uproar Quiz and input answers on this Google Form. Glue in new anchor charts to your interactive notebook. Practice differentiating between factual claims & commonplace assertion through Quizziz. Complete commonplace assertion assignment through Socrative. QUICK-WRITE through PADLET - Why do you think playing the national anthem and standing during the song might have become a tradition in U.S. sports and do you think all athletes should have to participate? What are some reasons people have for either agreeing or disagreeing with Kaepernick’s protest? Why might the author have included the sidebar “Olympics Protest”? How is the article structured? Complete Read and Respond to Nonfiction graphic organizer for the article. Watch The Humane Society of the United States’ video on cruelty in Nation’s Largest Turkey Hatchery. Read the nonfiction article, “Cruelty Exposed at Nation’s Largest Turkey Hatchery." ​Analyze article and identify examples of Ethos, Logos & Pathos. Analyze the author's claims for the nonfiction article, Should Sodas Have Warning Labels?, and decide who you think makes a stronger case. Complete Read and Respond to Nonfiction graphic organizer for the article focusing on one side of the debate. Continue working on The Westing Game Final Project. Directions and rubric are found by clicking on link above. Essay needs to be completed using your Office 365 account. Creative Project can completed using your Storyboard That account. 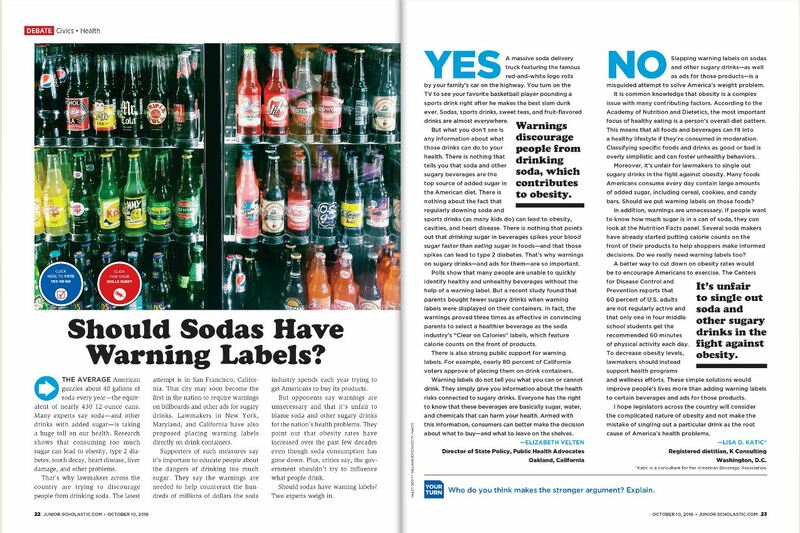 Complete Read and Respond to Nonfiction graphic organizer for the article, Should Sodas Have Warning Labels?, focusing on one side of the debate. Glue in new anchor charts in your Interactive Notebook. Watch How to Identify Ethos, Logos and Pathos by Shmoop. Complete Ethos, Logos, and Pathos notes and practice on pages 116 - 117 of your interactive notebook. Review differences between argument and persuasion on pages 118 - 119 of your interactive notebook. Read nonfiction article, Should Sodas Have Warning Labels? and complete Read and Respond to Nonfiction graphic organizer. Analyze the author's claims and decide who you think makes a stronger case. Complete vocabulary practice and paired texts quiz for "Is Anything Wrong with this Picture?" and "How the telephone Made America Rude"
Finish vocabulary practice and paired texts quiz for "Is Anything Wrong with this Picture?" and "How the telephone Made America Rude"
Read The Lazy Editor article, "Would You Want This Job?" and find and fix the errors in the article by following the prompts on the bottom of page 31. How to submit essay video is below. Complete vocabulary graphic organizer using Storyboard That. Choose 5 of the following words from the article, "Is Anything Wrong with this Picture?" Finish reading nonfiction article, "Is Anything Wrong with this Picture?" and complete Read & Respond Nonfiction graphic organizer for the article. Start working on The Westing Game Final Project. Take The Westing Game Character Exam. Complete notes and practice on order & sequence, problem & solution, and cause & effect text structures on pages 110 - 115 in your INB. Read "Is There Anything Wrong with This Picture?" in Scope Scholastic magazine. Complete notes and practice on description, compare & contrast, and order & sequence text structures on pages 106 - 111 in your INB. Complete Figurative Language Review Volume 1 & 2 assignment through Formative. Review for The Westing Game test through Quizlet. Read Is Anything Wrong With This Picture? in Scope Scholastic magazine and complete text features assignment through Formative.